This week I was working on getting some TV coverage for Enrique Flores-Galbis, a Cuban born landscape and portrait painter. 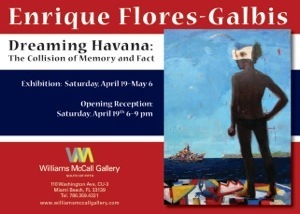 His work, “Dreaming of Havana,” is on display at the Williams McCall Gallery in South Beach, FL. The invitation to the opening is posted above. Born in Havana, he left in 1961 with Operation Pedro Pan arriving alone in South Florida at the age of 9. Also a novelist, his award-winning book, 90 Miles to Havana, was based on the events that led to his departure and the life he encountered in the U.S.
NBC 6 Miami, the local affiliate, jumped at the chance to tell the story. Click here for the segment. If the NBC app pops up. Just press “No Thanks” and then the TV appearance appears. Flores-Galbis received a Master of Fine Arts Degree from the Parsons School of Design in 1992. He has served on the Faculty of the New Jersey Center for Visual Arts for over twenty years and Parsons School of Design for over sixteen years as well as the Morris and Montclair Museums in New Jersey. Flores-Galbis’ work can be found in corporate, university, and private collections throughout the country. The Williams McCall Gallery is the first fine art gallery located in the South of Fifth neighborhood in South Beach and has become a “must visit” destination for art lovers and collectors. The gallery holds one of approximately 30 licenses issued by the U.S. Treasury Department to import artworks from Cuba. The gallery represents a diverse roster of local and international artists creating contemporary paintings, works on paper, fine art photography, encaustic collage and sculpture. There is a unique mix of emerging, mid-career, and established artists. Several of the artists have a strong Provincetown, Massachusetts connection – the oldest, largest, and continuous art colony in America. The gallery was voted the Best New Gallery 2013 by the Miami Sun Post newspaper. It was also a 2013 Finalist for Best Art Gallery by the Miami New Times newspaper. This entry was posted in digital, senior lifestyle, tech and tagged Enrique Flores-Galbis, Williams McCall Gallery by loiswhitman. Bookmark the permalink.